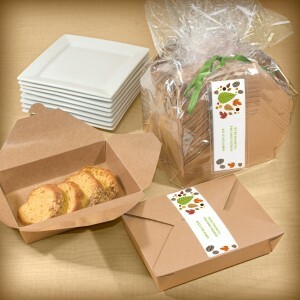 Gourmet-to-Go Kits from TheStationeryStudio.com are the perfect way to wrap up holiday leftovers. There is nothing better than Thanksgiving dinner – except for the leftovers. Just in time for the holiday season, TheStationeryStudio.com is solving the age-old dilemma of how to wrap up take-home food for guests after special events or family gatherings. Gourmet-to-Go kits are eco-friendly packages that make great personalized holiday gifts. They’re wrapped and ready for leftovers, hostess gifts, cookie swaps and homemade holiday treats. Hosts or hostesses no longer have to scramble to find non-recyclable plastic containers with matching tops or aluminum foil to pack leftovers. The creative labels and 100% recycled food-safe paperboard goodie boxes combine personal style with function. This new Stationery Studio exclusive features a set of 12 food-safe boxes and 12 personalized seals. The kraft-colored boxes are utilize 35% post-consumer content and are an environmentally-minded product. The boxes are leak-resistant, microwaveable, freezer safe and can hold hot/cold and wet/dry foods. Size is 7 3/4″ x 5 1/2″ and the boxes are approximately 2″ deep. The personalized 2” x 6” seals arrive in clear vinyl sleeve and are water and scratch resistant. The Stationery Studio, LLC, the industry’s leader in premier online personalized stationery is a one-stop shop for all holiday entertaining needs. TheStationeryStudio.com features more than 14,000 products that are featured frequently in national press outlets including “O” The Oprah Magazine, “In Style”, “The Today Show”, ABC-TVs “The View”, “The Rachel Ray Show” and more. Other Thanksgiving products from the company’s site include: personalized napkins, wooden serving bowls, turkey-themed place cards and personalized carving boards.